Kyôgen 3 The Overflying Doctor | Digitalestate Inc. Please enjoy “The overflying Doctor” in preview. 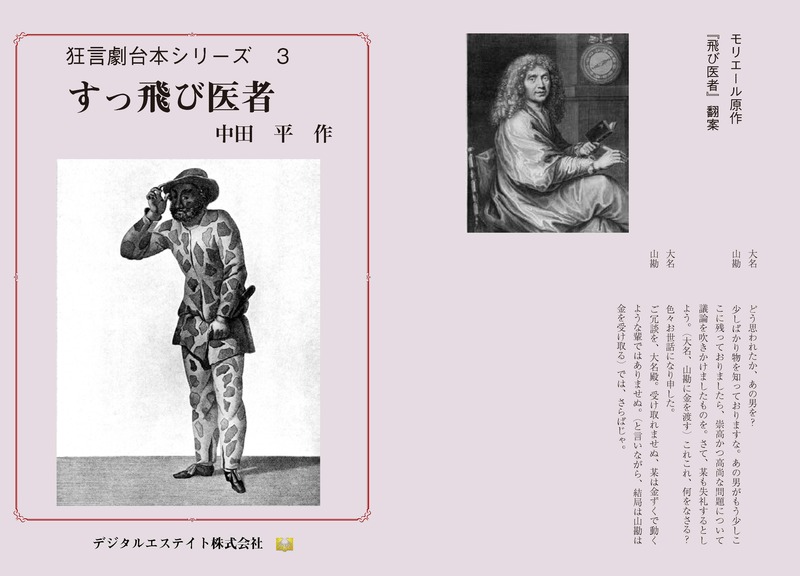 “The overflying Docto” is an adaptation of “The Flying Doctor” of Moliere, French playwright and theater organizer of 17e century, in order to revive it in the traditional Japanese performing art Kyôgen. The play begins with dialogue between the young warrior and Ayame. Ayame’s cousin Ruri is about to be married to an unwanted partner by her father, the Daimyo [local lord] and is using a feigned illness to prolong it as long as possible. Ayame suggests that Ruri had better to make some doctor advise the health resort therapy to meet the loving young warrior without father’s surveillance. To do that, a doctor is necessary, so the young warrior lets Yamakan, his own servant, do a fake doctor. Yamakan, saying that it’s the latest medical treatment, showed a drastic medical knowledge such as drinking patient’s urine to diagnose the illness, and cheated Daimyo fairly. Ruri was able to move to the detached room.There came the local magistrate who worried about the illness of Daimyo’s daughter, and Yamakan succeeded to make him believe that Yamakan is a high level doctor different from poor doctors. However, Daimyo found the young warrior together with Yamakan. Yamakan did not wear doctor’s clothes but casual wear, so he told a lie to him that he is a “brother like a twin to the doctor” automatically. However, it is impossible even for Yamakan to be two persons at once. At the end his person’s disguise was revealed by Tarôkaja, servant of Daimyos, and he bought the anger of Daimyo. Although he was near the point of binding, Daimyo acknowledged the young warrior as a good son-in-law, then a happy termination has come.